The Scottish Highlands are a beautiful and historic region in Scotland, containing many mountain regions that dominate the area. 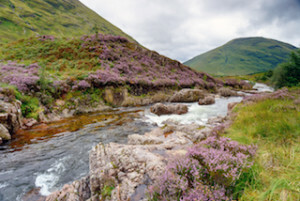 The Scottish Highlands are considered a natural playground of sorts, with so many sights and activities taking place in the lush greenery and landscape. This romantic region of Scotland is not one to be missed. The Scottish Highland region covers the northern two-thirds of the country, and contain some of the most incredible wilderness areas ever seen. The Orkney Islands, an archipelago located in the Scottish Highlands, are one of the many different areas to explore when visiting. One of Orkney’s most visited sites is the Neolithic village of Skara Brae. Regarded by many as one of the most remarkable prehistoric monuments in Europe, it is located on the Southern shore of the Bay O’ Skaill. It consists of 8 clustered houses and is heralded as a UNESCO World Heritage Site. 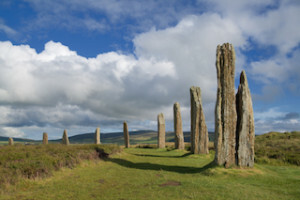 The Ring of Brodgar is another Neolithic site found in Orkney that should not be missed when touring the area. Also part of the UNESCO World Heritage Site, the Ring of Brodgar is a stone circle estimated to have been erected as far back as 2000 BCE! Located near Ben Navis, the largest mountain in the region, is the town of Fort William: the second largest settlement located in the Highlands of Scotland. Often called “The Outdoor Capital of the U.K” Fort William offers all types of exciting activities involving the beauty of the nature all around. Spend a relaxing afternoon fishing and basking in the beauty of the countryside. Or, for the adrenaline seekers out there, go white water rafting or skiing! If the history of the Highlands intrigues you, stop by the West Highland Museum located in the center of Fort William. The museum’s goal is to cover every aspect of Highland history through exhibits and artifacts. You can even study the military history of Fort William there. Glen Coe is another breathtaking outdoor adventure found in the Scottish Highlands. Considered one of the most spectacular spots in Scotland, Glen Coe is of volcanic origins and is even part of the designated National Scenic Area of Ben Navis and Glen Coe. Named after the river Coe, which runs through the glen, Glen Coe is surrounded by mountains; the village of Glencoe is located at the foot of the glen. 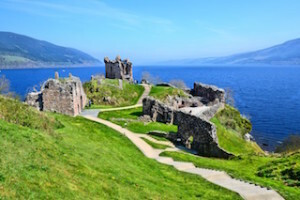 Located in the Highlands Loch Ness is one of the most well-known of the Scottish Lochs, due to the Loch Ness Monster known as “Nessie,” and its alleged sightings. The second largest loch in Scotland in terms of surface area, Loch Ness contains many species of fish native to it. On any visit to the Highlands of Scotland, the Loch Ness is not to be missed. Check out the Loch Ness Centre and Exhibition, where you can learn more about the natural history and legend of Loch Ness. A unique feature to the Scottish Highlands are the abundance of castles found throughout the area, often dating back hundreds of years. This is one of the factors contributing to the consideration of the Scottish Highlands as a romantic area, and these many castles are often chosen as wedding sites. The Urquhart Castle is one of these many magical castles. Located on the banks of the Loch Ness, its ruins date from the 13th to 16th century. Dunrobin Castle is another of notable mention located in the Scottish Highlands. Take a tour of the castle’s staggering beauty and peruse the property’s gardens.